While modern technology conveniences are great, they are making everyone—from babies to adults—move less. Fine motor skills aren't being developed in kids. The foundation of a strong heart, lungs and muscles are not developed. In addition, it's also setting kids up for a sedentary lifestyle, which may lead to obesity as adults. Starting a good habit of physical activity at a young age will last a lifetime. The key to getting 60 minutes of aerobic exercise every day, as recommended by the CDC , is to make fitness fun for kids. Running in place on a treadmill or sitting on a stationary bike most likely won't spark joy for your child. What do kids like to do? Run, play, skip, hop and jump. In our jam-packed, over-scheduled world, it's easy to skip time for exercise. The key is to sneak it in as a family. It will prepare your kids for years of physical activity and will help you stay in shape as well. Outside is free. If you have a backyard, let your kids wander and explore. 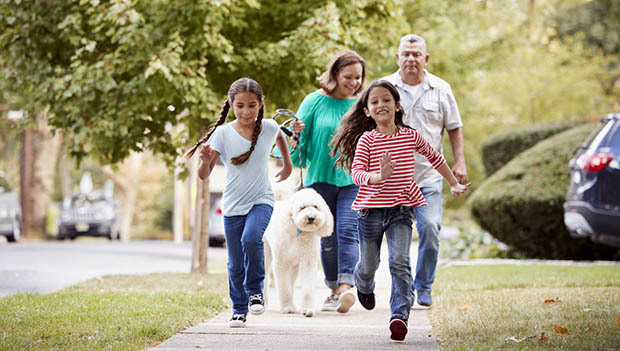 Go for a family walk or run, a bike ride, play tag, play catch or do whatever to enjoy the fresh air. Go on an adventure that's part hiking and part treasure hunt in search of hidden things you can track by GPS coordinates. Visit Geocaching.com and type in your home address (or the address where you plan to be walking or hiking) to find a few geocaches stashed in the area. Plug in the coordinates into your GPS or on your smartphone, and head out the door to find your treasure. Kids love finding the hidden gems. Just be sure that you don't take it with you; leave it for the next person to find. Playgrounds and parks are an endless opportunity for kids to run wild and use their imagination. You can't get more active than swinging, sliding and climbing. Don't just sit on the sidelines and watch—get out there, and let your inner child have some fun! You could also bring a bat and ball or a kite from home to take advantage of the open space. Channel your inner ninja warrior by setting up your own backyard obstacle course. Make it a friendly competition to see who can finish it fastest. Kids love to dance. Push the living room furniture out of the way and make a dance floor for everyone to shake their little hearts out. Make it a habit of going for a walk of any distance before or after dinner. It's a great way to catch up on the events of the day and to get in more activity as a family. Take one day out of the weekend and make it an activity day. Go hiking, ride bikes on a new trail, hit the bowling lanes, go to a rock climbing gym or to a high ropes obstacle course. When watching TV, make every commercial break an exercise break. Have the whole family do push-ups, squats, jumping jacks or high knees. It's a way to break up sitting on the couch with short bursts of exercise. Shooting hoops is great, but take it to the next level with Musical Basketballs. Like musical chairs but with basketballs, this game requires one ball for each player, plus music. Put the balls in a circle and have the kids walk around the circle, just like in musical chairs. When the music stops, the kids will grab a basketball and shoot a basket. Once a player makes a basket, they sit down to show that they are finished. The last player standing is out. Tag is a great game for any age. It may seem simple, but it's actually helping to build skills for other sports like basketball and football. The starting and stopping from a dead stop are similar to conditioning drills routinely used. If you live relatively close to your kids' school, take the trek as a family. You'll save on gas and will sneak in some exercise. When you roll out your yoga mat, make sure to grab one for your child as well. They will love to practice poses like downward facing dog, cat pose, tree or happy baby.